California Gov. Jerry Brown announces his proposed budget at the California State Capitol on Jan. 10, 2011, in Sacramento. If you had hoped Jerry Brown would use his budget proposal Monday morning to tackle California's broken budget system, you should be disappointed. From listening to his briefing and from an early reading of the budget (available here), Brown is offering very limited reforms -- while doing nothing to change the state's downward trajectory and pushing fiscal reckoning only a few years into the future. Over the next few days and weeks, we'll have more at Prop Zero on the specific details of the budget. But in general, the budget is hard to evaluate because it offers so many more questions than it does answers. 1. The budget is based on voters proposing tax increases, but doesn't indicate what will happen if those tax increases -- which are extensions of 2009 temporary tax increases on income, sales tax and vehicles -- don't get on the ballot or are turned down by voters. Since the tax increases are at the heart of the proposal, this is a big problem. In conversation and news stories, Brown administration officials had indicated they would confront voters with a clear choice between tax increases and cuts. But this budget suggests they won't make the choice so clear, because they don't want to specify which cuts they'll make if the taxes aren't approved by voters (in what Brown hopes will be an early June special election). As Dan Weintraub points out at HealthCal today, this could be a big mistake. If you give voters a choice between unappetizing option -- tax increases -- and the uncertainty of unknown cuts, they may well be inclined to take a chance on uncertainty. Writes Weintraub: "If the Democrats go to the polls implying that a vote against the taxes will trigger another round of cuts, the voters might well call their bluff, because voters tend not to believe politicians when they say they’ve cut all they can from government programs." 2. Funding for the central "reform" of Brown's budget -- a realignment of state and local government responsibilities -- runs out in five years. And it's not clear where the money will come from. Brown proposes to extend the tax increases for five years. The budget relies on that money not only to forestall tax increases but to provide money for local governments. Under the Brown budget proposal, local governments, particularly counties, would have more responsibility for a host of items in criminal justice and social services. The state will give them money to cover those responsibilities for five years. 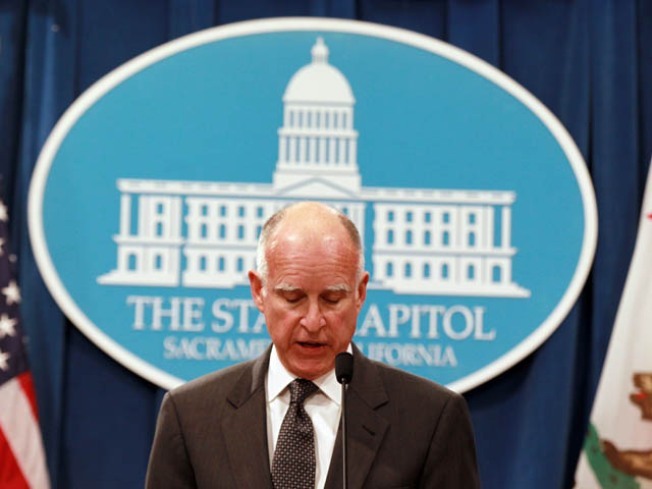 At his press briefing Monday morning, Brown made the promise -- a highly irresponsible promise -- that the state would cover those local costs even after tax money expires. But when asked where that money would come from, Brown made a reference to economic growth and additional tax revenues from that. He might just as well have said the Tooth Fairy would pay for it. If Brown were more serious about realignment, his budget proposal would pair the realignment of program authority with a broad reform to give local governments more authority to raise taxes to cover costs. But Brown doesn't go there -- except in a very narrow way (He has a proposal to allow local governments to raise some taxes if it goes for certain economic and redevelopment). Why doesn't Brown do this? He dodged questions about his own thinking Monday morning, but it's a safe bet that he's trying to avoid a fight with the right over taxes, particularly since giving local governments more taxing authority could be seen as an attack on one provision of Prop 13. So, right from the top, a Democrat who won in a landslide bows to the anti-tax right. When folks on the left figure this out, it will be interesting to see whether they put partisan loyalty to Brown first and hold their fire, or oppose the governor for this surrender. 3. Since Brown makes no effort to reform the broken budget system here, it's not clear from this budget how Brown can really stop the fiscal picture from worsening. Put simply, there is no vision of a better future here. Fiscal reform is often called politically impossible. But the problem with keeping the existing budget system is that the current system isn't static. The California budget system, as my New America colleague Mark Paul argues in this excellent post on the state's budget hell, is always working to make things worse. Our initiative process allows voters to mandate spending, tax breaks, or borrowing that deepens the crisis--and they do. (Last November's election blew an additional $2 billion hole in the budget). The 2/3 governing system allows legislative majorities to cut taxes -- but says those tax increases can be restored only by a two-thirds vote. By not addressing the system, Brown is effectively ensuring that things will get worse. A new governor has an opportunity to make big change. But Brown seems content, as he explained, to explain to voters the facts of the current predicament. He doesn't offer a way out, an approach to reform that gets California to a better place. The best Brown's approach offers is big cuts in social services, huge rises in university tuition, higher taxes, and (if we adopt the higher taxes) flat spending on K-12 education in a state that adds 400,000 people a year. This budget is all pain -- without the compensation of a better future. Why should anyone -- legislators or voters -- go along?